This swivel glider chair provides an excellent accent piece or alternative seating option suitable for a variety of rooms in your home. Simple design features like tight attached back, waterfall skirt, and high English arms make this chair a design chameleon- able to fit in with all styles of decor. Comfort was not neglected in the design of this chair, as it has a poly fiber wrapped frame for structure and resiliency, as well as a deluxe seat cushion filled with blend down for super soft support. The Azriel Casual Swivel Glider Chair with English Arms and Waterfall Skirt by Sam Moore at Reeds Furniture in the Los Angeles, Thousand Oaks, Simi Valley, Agoura Hills, Woodland Hills, California area. Product availability may vary. Contact us for the most current availability on this product. Choose a chair from the Azriel collection to add that finishing decorative accent to your casual style room. 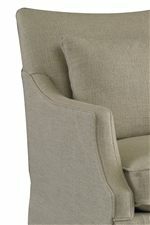 Stylish and comfortable, these chairs have seat cushions filled with blend down for a soft and resilient seat. 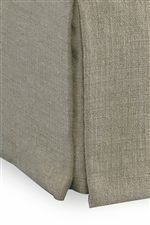 Included with both club chair and skirted chair are blown fiber kidney pillows in matching fabric shades, which add to the physical comfort and aesthetic design of the chair. The Azriel collection is a great option if you are looking for Casual furniture in the Los Angeles, Thousand Oaks, Simi Valley, Agoura Hills, Woodland Hills, California area. Browse other items in the Azriel collection from Reeds Furniture in the Los Angeles, Thousand Oaks, Simi Valley, Agoura Hills, Woodland Hills, California area.